Foshan Metro or more commonly known as FMetro, is a rapid transit system that serves the city of Foshan, Guangzhou. 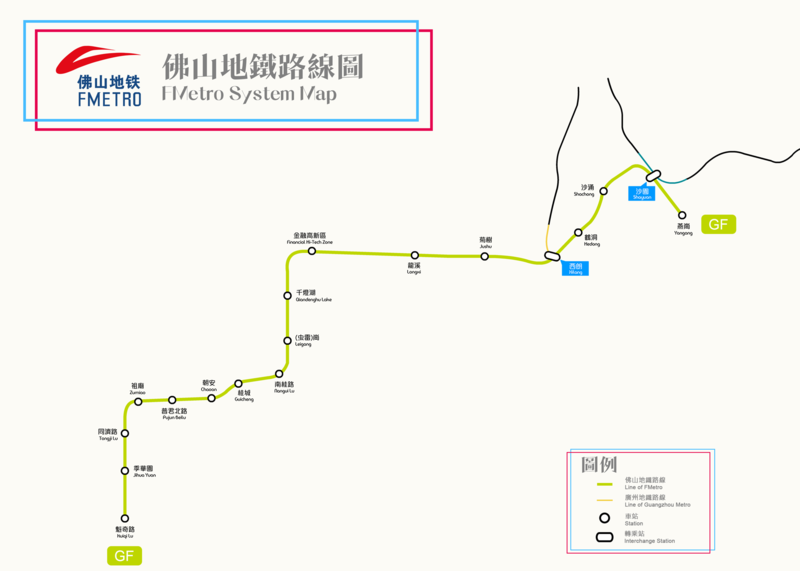 The tenth metro system to be operating in mainland China, the FMetro currently operates on 1 line, serving 18 stations in total. This 27.3 km long network is majorly operated by Foshan Railway Investment Construction Group and partly by the Guangzhou Metro Corporation. It began operations on the 3rd of November 2010, this metro system has only increased its popularity year after year. As of 2015, it boasts of a daily ridership of 268,000 at peak hours. Further expansion plans are under way with 2 more lines and an extension of the present line already under construction. Map of F-Metro showing various lines and stations (including future expansions). Click on the map to enlarge it or download F-Metro Map in PDF. Download this Map in PDF. The metro service starts operations at 6:00 am and runs until 11:00 pm. The trains run at an interval of few minutes. They are packed during weekends as people from Foshan head towards Guangzhou. Reaching downtown Foshan from downtown Guangzhou takes about one hour and costs approximately 5 Yuan. The Line 1 starts from Xilang and runs till Kuiqiang Lu in Foshan. The single journey tickets can be purchased from the vending machines at the stations. The system also offers Students cards for students of primary, high and vocational schools. The card offers 50% discount on fares. Senior citizens aged 60-65 years can also avail discounts of 50% discount on fares, by using Senior Citizen cards. Senior citizens above the age of 65 years can ride the metro for free. Discounts can also be availed for Group tickets, which can be purchased for a group of 30 or more passengers. The ticket offers a discount of 10%. There are park and ride lots available in most metro stations where metro riders can park their vehicle. The following things cannot be taken inside the premises of the metro network: ammunition and arms, animals, flammables, explosives and other dangerous items. Running around chasing people and causing trouble is prohibited. Be careful not to climb over fences, locomotives etc. Cleanliness is given priority and a number of acts such as spitting, urinating etc should not take place anywhere within the metro network. Currently the one line under operation is the Guangfo line – Line 1 was opened to public in 2010 and the length of the line is 20.4km, serving 14 stations. The line operates between Kuiqi Lu and Yangang. The extension of this line from Yangang towards Lijiao will open in 2016. When the extension work will be completed, the route will be 32.2km long, serving 21 stations out of which 10 stations will be located in Guangzhou.